Ubisoft Montreal may have worked itself into a corner. With Far Cry 3, the studio created an unhinged murder named Vaas Montenegro. This pirate leader was, unpredictable yet so charismatic that fans loved hating him. How could Ubisoft Montreal possibly up the ante with Far Cry 4? Their answer is a man named Pagan Min. 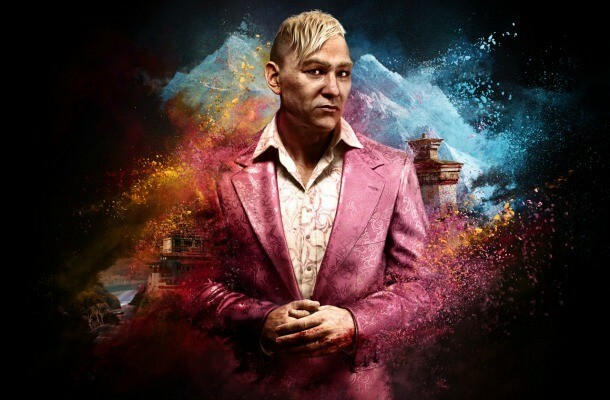 Creating a visual style for a villain isn’t easy, and Ubisoft agonized over the Pagan Min’s design. The developer wanted their main villain to be a confident character, but one who was also brash and prone to violent outbursts. Ubisoft Montreal eventually honed in on characters like Beat Takeshi from Brother and Ichi from a Japanese movie called Ichi the Killer. Both of the characters from those films wore vibrant suits that helped them stand out from the crowd. This inspired Ubisoft Montreal’s concept artists to render Pagan in a bright pink suit. The redrafted story became about a young man named Pagan Min. However, Pagan’s birth name is actually Gang Min. Born the son of a mid-level drug boss in Hong Kong, the Min family was well off, but not without its conflicts. Pagan’s mother was a British expatriate, and Pagan’s mixed heritage caused his father a great deal of shame among the criminal elite. As Pagan grew up, he started to work for his father, but his father was always a small fish in a big pond and Pagan had bigger ambitions. Pagan saw his father – and his contemporaries – as relics of the past. They were dinosaurs, and it was time for a change. Pagan took his family’s modest fortunes and built a small private army. But small armies don’t go unnoticed, especially within the Golden Triangle (one of the world’s largest regions of opium production located between Myanmar, Laos and Thailand). Pagan’s father had had a lot of powerful friend within the criminal underworld, and Pagan was turning them into a powerful enemies. Not long after Pagan made a grab for power, the “dinosaurs” put a price on his head. Looking for sanctuary, Pagan sought refuge in a small failed state in the midst of a civil war. This country was Kyrat, and Pagan believed he could become the country’s savior. In 1987, as an arrogant 21-year-old, Pagan entered Kyrat and began a bloody siege that ended only after Pagan was firmly seated on the throne. The young overlord’s new Royal Army corrupted existing business and infrastructure, and many of the profits from the heroin trade boosted Pagan’s coffers. Kyrat’s new monarch even planted his face on the money, and his official department of communications started blasting propaganda from radio towers scattered across the country. Kyrat became a fractured reflection of its narcissistic ruler. 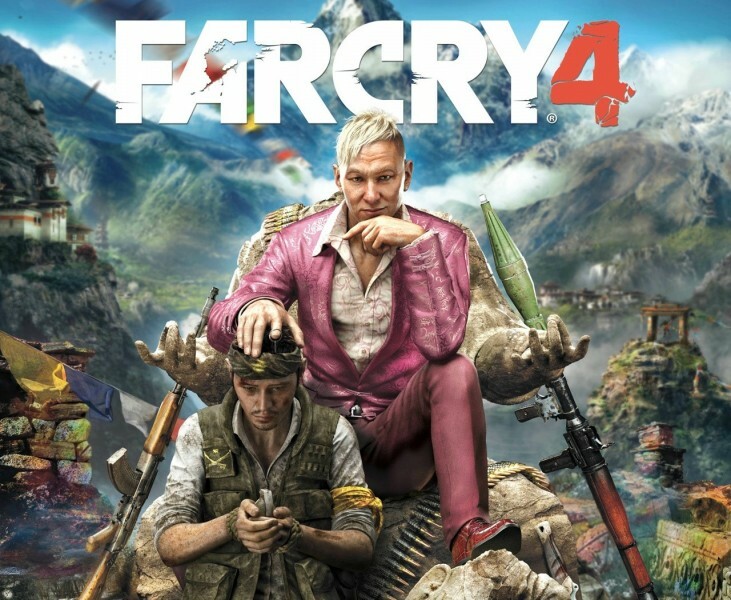 In order to realistically portray such a sadistic yet colorful character, Ubisoft knew that they’d need a strong, charismatic actor. Ubisoft landed on veteran voice actor Troy Baker, who’s roles as Booker DeWitt in Bioshock Infinite, Joel in The Last of Us, and Delsin Rowe in Infamous: Second Son (as well as dozen’s of other characters) have made Baker a familiar voice in the industry. Pagan may be powerful, but his power isn’t unchallenged. Early into Pagan’s leadership, a resistance movement led by a man named Mohan Ghale frustrated Pagan’s supremacy with tactful guerilla skirmishes. However, Mohan and Pagan weren’t just fighting for a country; they were fighting for the love of a woman named Ishwari. When this awkward love triangle ended with Mohan’s death, Ishwari fled the country, and Pagan retreated into his palace, leaving Kyrat to his lunatic governors. This is where players enter into the story. As Mohan’s son – a man named Ajay Ghale – players return to Kyrat for the first time since they were a child in order to scatter their mother’s ashes across the top of Kyrat’s tallest mountain. This is the opponent players will have to face down as soon as they cross Kyrat’s borders. Pagan is a psychopathic mess who is terrified of dying alone without a legacy, so how will he treat the son of his one true love and his most hated rival? Players will have to wait until Far Cry 4 releases this fall to find out. Don't forget to click on the banner below to assess our entire month's worth of Far Cry 4 content.